Slice the leek and sauté over a low flame in the extra-virgin olive oil. Finely chop the garlic and add to the leek, together with the curry powder and ginger (to taste). Then add the lentils, carrots and squash (peeled and cubed) and continue sautéing until the vegetables brown slightly. Add the vegetable broth and allow to cook for 10 minutes in a pressure cooker. 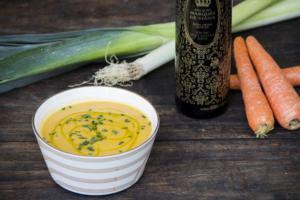 Purée, and just before serving adorn with chopped fresh chives and our Palacio de Marqués de Viana Sublime Blend EVOO, which complements this soup perfectly thanks to its note of aromatic herbs.